This is one of my favorite subjects that I have been going around all these years working on it and just to tell you about the diabetes and hypertension we increasingly recognize as we see a lot of diabetes patients in our OPD. Five years ago, I used to tell people that almost 30-40% of diabetic patients have hypertension, within 5 years my concepts have changed and as we see more and more diabetic patients, we find that almost 60% of these patients have hypertension. Increasing awareness about taking of blood pressure in diabetic patients is very, very important. Cardiovascular events are more prevalent in hypertensive diabetics then in normotensive diabetic. This is very well known. Microalbuminuria is more prevalent in hypertensives, that is, 24% versus 14% in normotensives. The risk of developing diabetic nephropathy is 10-20 fold greater than in patient's with type 2 diabetes who do not have microalbuminuria. It has been considered that microalbuminuria detection is considered as good as having a cardiovascular disease or having a retinopathy. The coexistence of diabetes and hypertension leads to increase cardiovascular morbidity and mortality. The process of type 2 diabetes in India is increasing at very fast pace and this is likely to also contribute to a significant burden of hypertension. 30%-35% ,this is what was my concept, similarly the incidence of hypertension is 1.5 to 2 times greater in patients with diabetes mellitus as compared to nondiabetics. What is so great about the Indian hypertensives, why do we have diabetics having hypertension? The Indian hypertensive, they are centrally obese, so increase insulin resistance. Young people have hypertension as I already eluded to in my earlier lecture. There is insulin resistance in centrally obesity and combination therapy of hypertension is recommended early in diabetic hypertensives. This is a pathophysiology of insulin resistant and hypertension, how it causes primary, secondary insulin resistance and the primary CNS drive also causing insulin resistance. This is a very important statement regarding the management of hypertension and diabetes. UKPDS, a very, very important trial, a mega trial, which opened the eyes for managing of controlling blood sugar and the very important observation made that time, 15-20 years ago, that blood pressure reduction itself may be more important than the 2 types of drug, that is, ACE inhibitor or beta-blockers. I think Dr. Venkata Ram eluded this yesterday that don't give a misconcept that by this UKPDS statement that control of blood sugar is not important, but what is important in this statement that blood pressure reduction itself may be more important that 2 types of drugs. The ACE inhibitors and beta-blockers were being used increasingly at that time, but now we have other drugs used to achieve it. Health economic analysis showed that tight blood pressure control is cost effective when compared with other widely use preventive strategies and is more feasible for most clinicians and patients than tight blood glucose control. A very important statement made in the UKPDS. In the ADA position in 2002, A-level evidence shows that patient with diabetes should be treated to a diastolic blood pressure of 80 mmHg. In the ADA statement in 2013, at that time they said systolic 130, but now they have said that the target blood pressure should be 140/80 and that has been also eluded to in the Indian Guidelines on Hypertension. Initial drug therapy may be with ACE inhibitors or ARBs, beta-blockers or diuretics, additional drugs must be chosen from these classes or another drug class. This, we will discuss. In patients with diabetes blood pressure target should be less than 140/80 mmHg as per the recent ADA guidelines brought out in 2013. This is from the guidelines again, that blood pressure should be measured on each visit of the diabetic patient in the procedure for measuring, because diabetologist they only think in terms of controlling blood sugar, but this has been very, very emphatically recommended that blood pressure should be measured on each visit of the diabetic patient and the procedure for measurement is the same as in ordinary hypertensive patient. Yesterday, we learnt about the measurement of blood pressure by Dr. Guha, very nice lecture. In diabetic population, it is imperative to measure the blood pressure in supine, sitting, and standing position to exclude the possibility of autonomic neuropathy and postural hypotension. Management of the hypertension. I will straight go into this. All the guidelines mention this whether it is Indian, European, NICE guidelines or JNC guidelines or Indian Guidelines on Hypertension. They all say that non-drug treatment should not be forgotten in the management of hypertension. Some of the earlier trials like UKPDS and HOTT showed evidence in favor of treating high normal blood pressure aggressively, but subsequently in the ESH/ESC guidelines 2007, no definitive data was available to substantiate this. It is recommended in the guidelines that high normal blood pressure, we have done away with terminology of prehypertension. Even in the second guidelines, we have never mentioned about prehypertension. They were reasons for that because if you talk of prehypertension in the lifespan of an individual, 50% are never going to get hypertension. Treatment of prehypertension is going to be lifestyle modifications. If you label a person as prehypertension he will only think of hypertension and not prehypertension, that is always thought of even by the physicians. They forget that prehypertension is not to be treated with medicines and this is forgotten as soon as a physician sees a prehypertensive, he has a itch to start medications, which is not recommended and that's why the Indian Guidelines on Hypertension has done away with this terminology of the prehypertension and they have called it as high normal blood pressure. It is recommended that in high normal blood pressure more aggressive lifestyle measure should be followed while blood pressure of more than 140/90 mmHg should be treated with pharmacotherapy to achieve cardiovascular and microvascular protection. I will not be going to the details of this. We have discussed it at length yesterday the lifestyle modification and the non-drug treatment approach, which remains the mainstay of treatment from the day 1 of diagnosis of hypertension till lifetime I believe. In the management of diabetic hypertensive, this is from Indian Guidelines, lifestyle modification has to be more than aggressive. Lifestyle measures include weight loss in case of obese, dietary changes like low-salt and low-fat, regular exercise form the basis and are applicable at all stages of hypertension. It has been proven that it is useful and effective to treat hypertension in people above the age of 65 years. Ideal antihypertensive drug: 1: Which reduces the blood pressure effectively, neutralizes the glycemic effect, reduces insulin resistance, neutralizes lipid effect, does not have effect on uric acid, and does not have the effect on the lifestyle of individual, that is, does not cause impotence. There are all the drugs, which are available. You are all aware of it. I will not go into details. Diuretics, ACE inhibitors, beta-blockers, ARBs, alpha-blockers, centrally acting drugs, calcium blockers, renin inhibitors, vasodilators. We are talking of combining all these drugs and in certain resistant hypertension you might have to use the not so conventional drugs in combining them to achieve the target blood pressure. It has been observed that to effectively lower the blood pressure, a combination of 2 or more drugs are required for controlling the blood pressure to target levels in a diabetic population. ACE inhibitors in the HOPE trial and ARBs in the ONTARGET trial emphasized the importance of RAAS blockade to reduce the risks of complications of diabetes especially both macro and microvascular complications. Therefore, ACE inhibitors are recommended as the first line drug therapy while ARBs may be used in patients who are intolerant to ACE inhibitors. CCB's have been shown to be useful as monotherapy and in combination with ACE inhibitors in the ASCOT trial. The combination of amlodipine and perindopril, this was discussed at length yesterday, was associated with significantly less incidence of new onset diabetes as compared to the combination of beta-blockers and diuretics. Beta-blockers potentially mask hypoglycemic symptoms. Beta-blockers are falling into disrepute in ordinary hypertensive patient, but it diabetic population with evidence of coronary artery disease and congestive heart failure they may be quite useful. This was also at length discussed yesterday, but I am sure Dr. Amaresan will talk about this in his lecture and Dr. U Kual and Dr. Venkat Ram. It is recommended that we may use cardiovascular selective beta-blockers like nebivolol and carvedilol. Alpha-blockers can also be used as useful agent in the treatment of the above clinical scenario. The ACCORD trial in diabetic hypertensive has shown benefits of effective BP control in diabetic patients. It was observed that to prevent 1 stroke is very, very important observation, it requires to treat 89 patients with intensive therapy of blood pressure control for a period of 5 years, but that intensive treatment is very important because you know what stroke entails. No one wants to have a stroke. In hypertension especially with comorbid condition diabetic one has to be very, very careful and it is recommended that we need to bring down the blood pressure to a target level. The ADVANCE and the INVEST trial shows definitive improvement in the microvascular complication especially in kidneys, but there effect on eye and neural complications is questionable. The therapy and the targets need to be individualized for each patient depending on age, young or old; comorbid conditions like kidney disease, heart disease, stroke, retinopathy, and peripheral neuropathy has to be considered in choosing a drug; cost factor of this, going to be a life long, as I have some patients take treatment 1, 2, 3 months, 1 year and then stop it. It's a life long treatment and cost factor do come in and socio and psychological factors also are very important and also health conditioning, impotence, whether it creates impotence or not also has to be considered. The use of ACE inhibitors and ARBs is contraindicated in certain situation. Use of diuretics during pregnancy can lead to reduction of plasma volume which can result in low perfusion resulting in decreased fetal growth and fetal damage. This has been recognized in the guidelines also in Management of Hypertension in Diabetes. So, ACE inhibitor, ARBs we all know, we don't use in pregnancy, but also mention about the diuretics. These are the various trials I think yesterday this has been discussed and the compelling indications and the recommended drug, we all know about what is diabetes, chronic kidneys, and stroke prevention. Thus, to conclude most patients with hypertension will require 2 or more antihypertensive medications to achieve goal blood pressure. In diabetics, BP should be lowered to as low as can be achieved without side effects. Yesterday, we were discussing about patients having hypotension symptoms even when you reach the levels of blood pressure 130/80, so that is what is important. Is that the blood pressure should be lowered to as much as a patient can tolerate. You should not make him flat by controlling his hypertension, so he has to be active, he has to be mobile, so even if you can reach 130/80 or in patients who can tolerate even 110/70 is welcome inpatient's with diabetes and hypertension, if you can tolerate that blood pressure. The most effective therapy prescribed by the most careful clinician will control hypertension only if patient's are motivated, this is very, very important. Motivation improves when patients have positive experience and trust in his clinician and the trust and motivation will only increase if you have frequent followup with these patients because every followup will clear a few questions that are there in the minds of the patients. Empathy builds trust and is a potent motivator. Dr K D Tibrewal: Thank you Dr Siddarth Shah for 2 excellent deliberations and amply so we have to come out with our Indian guidelines. JNC 7 has not yet come out even after 10 years, for JNC 8, after JNC 7 it came in 2003 even after 10 years we are not out with newer guidelines. We have got such a huge population we should have our own guidelines in our setup. I think we have a lot of questions for you. Question from Audience: Can we use the ACE inhibitors in nonhypertensive type 2 diabetes? Dr. Siddharth Shah: Well, especially this question has come up with patient's who are normotensives and use of ACE inhibitors, especially for kidney protection, and I think this will be taken up in the next lecture, but it is recommended, especially patients having microalbuminuria. ACE inhibitors are recommended in normotensive patients if they have any comorbid conditions, but personally I would not like to use ACE inhibitors in a normotensive individual, if he has no comorbid conditions, but if there is a comorbid condition, normotensive with even a marginal amount of microalbuminuria, we must use ACE inhibitors. Question from Audience: Some of these long-standing type 2 diabetics who are not hypertensive, their intrarenal glomerular arterial hypertension is more and this is one; if it is reduced, they may be protected, kidney protection may be there. Dr. Siddharth Shah: That is what I said, comorbid conditions, consider the comorbidity, diabetes is a comorbid condition. Hence, we have to take a call using the ACE inhibitors. After all ACE inhibitors are not absolutely safe. Question from Audience: Sir, in one of your slide you said that ACE inhibitor should be the first line of drug and if it is not tolerated probably the ARBs, but yesterday in one of our discussion, Dr. Hiremath had a view point that ACE inhibitors are the best drug if patient has hypertension with ACS, otherwise probably ARBs are. If a simple, plain, uncomplicated hypertensive patient, what will be the first choice, the ACE inhibitor or ARBs. Dr. Siddharth Shah: Okay, I think this debate will always go on, but metaanalysis of the trials that have been done up till now, it has been mentioned and guidelines have also said the same thing that ACE inhibitors are the first drug of choice. There is very little difference between the ACE inhibitors and ARBs. I am giving a statement which is very very controversial, but that has been put in the guidelines that ACE inhibitors and ARBs, there is very little difference and there are some pleiotropic effects in the ARBs, which prompt us to start with ARBs, but remember the cost factor as I told you. The guidelines does mention about the cost factor and the lifestyle, so ACE inhibitors are definitely considered as the first line of therapy. Question from Audience: But sir, let us all admit it very clearly that ACE inhibitors now a days are not being prescribed by the physician as the first line of treatment if it is a plain simple uncomplicated hypertension. Dr. Siddharth Shah: ACE inhibitors are the first drug of choice according to me in diabetes. Question from Audience: No sir. I think all of us will agree that the ARBs have become the first drug of choice in plain, simple, uncomplicated hypertension in young. Dr. Siddharth Shah: As far as the guidelines are concerned, ACE inhibitors and ARBs as of now are clubbed together. Dr. Amaresan: Excellent coverage of the whole guidelines, but then I got one particular point, that as diabetologist you call impaired fasting glucose if the fasting blood sugar is more than 100 and also you got impaired glucose tolerance. What is the harm if it is more than 120/80? You call it as a pre-hypertension why you want to call it as a high normal, because there are many articles which state the pre-hypertension has got similar complications to hypertension because there is an existing endothelial dysfunction in the very beginning itself exactly like IGT and IFG. Dr. Siddharth Shah: That is what we are trying to say. We are not saying prediabetes, we are saying IFG and IGT, so we are not saying prediabetes. So, that is a big debate over the world and there are conferences for prediabetes also and this is what the core committee decided that you are labeling someone as a pre-hypertension and of these 50% are not going to be hypertensive in the whole lifespan, so why label someone. That is the debate that we had. Core committee members unanimously agreed that we should not call it pre-hypertension, call them as high normal. Question from Audience: You said about the pregnancy, diuretic should not be given. Latest Braunwalds say they have conducted a trial of 5600 pre-eclampsic patient of diabetes, given the diuretics, they do not find any of the changes in the fetal and the outcome was good compared to those who have not received the diuretics. This is the latest Braunwalds report. Dr. Siddharth Shah: No sir, we do not agree on this issue because diuretics are really not used, they are not recommended. Question from Audience: It is written in the latest Braunwalds latest that 5600 pre-eclampsic with pregnancy they have received diuretics. Dr. Siddharth Shah: But that statement will change diuretics are not recommended in pregnancy with hypertension. Question from Audience: I have 2 questions, one regarding lifestyle management and one again about diuretics. Sir, in our Hindu culture when we go to a temple, we keep our shoes outside and then go and pray to God and most of the time we worry about the shoes rather than God, whether they are there or whether they are gone from outside. So lifestyle modification is something like that because once you advice lifestyle modification, you know how difficult it is to follow. Almost 30% of our current patients straightaway dismiss saying that it is not possible, 30% of them try to follow, initiate, and after month or 2 or 3 months they stop it and 30% of it continue for a few years, they never continue it throughout their lifetime. So, I think considering all these things recommending just lifestyle management and talking about lifestyle management is like praying for some good things to happen. Dr. Siddharth Shah: I would answer that first; lifestyle modification as has been said in the guidelines shall remain throughout his treatment of hypertension. Imagine if you forget that you will have to step up the dose of your antihypertensive agent, what is important and that is why I said that followup of these patients is very, very important. Every time you followup, something will come up as far as lifestyle. I will give a simple example in diabetics, my dietitian talks about the diet for half an hour with the patient then the patient comes to me, I solve the problems of what has been discussed with the dietitian also with the patient, and then when the patient is getting up, I ask them, you understood about the diet, what fruits not to be taken? What is the first question that they will ask you, in spite of 15 or 16 followups, can I have apple. Is it not your experience? In spite of telling them that these are the fruits you are supposed to take and these you are not supposed to take, every time the same questions will come to you, can I have apple. 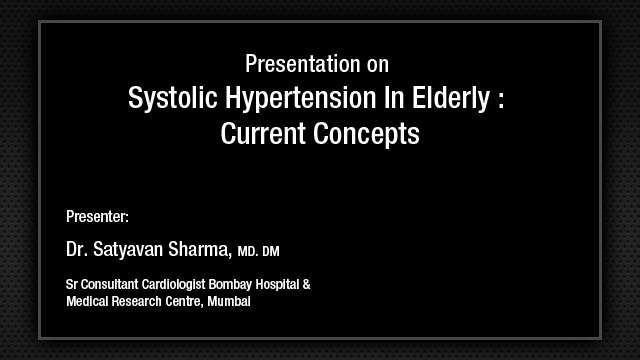 So similarly, whenever you are discussing with the patients, same thing will come in hypertension. Can I have little salt, can I have pickles, can I have papad, please give me this? So, this is going to be there and if you do not tell them, imagine that the blood pressure, if you have reached 140/90, a little more control on salt and little exercise without increasing your medication can bring down the blood pressure to the target level, what would you prefer, and that is why on the guidelines we always mention. Guidelines are just to give you an information, how you take it, it is for you to decide, but this is what we try to inculcate, that is why the need of the guidelines. Our thinking has changed over the last 5 years. From guidelines 2 to guidelines 3 we have changed our thinking and that is why we have recommended the diet. Dr. Guha: So far cardiovascular protection is concerned, ACE inhibitors score over ARBs because the metaanalysis has showed that ARBs are at best neutral on cardiovascular protection while the ACE inhibitors are certainly beneficial that is #1, but to respond to that question why ARBs are being used as a first line, that is mostly for the side effects profile. It is almost neutral on that ground. The patient won't come back with cough or other symptoms that is why we are giving ARBs, although the evidence wise perhaps ACE inhibitors should be given. Dr. Siddharth Shah: I think that point has to be noted, we are in the same tune, where it is not tolerated, yes I would definitely recommend, but first drug should be an ACE inhibitor. Dr Guha: Secondly you mention in diabetic hypertensives that lower the better to the tune of 110/70, if that is tolerated by the patient, but in the INVEST trial there was an increased incidence of sudden cardiac deaths in these patient, so perhaps one should be cautious lowering to that level of 110 or below. Dr. Siddharth Shah: No, I think in diabetic hypertensive it is as lower as possible for increased renal perfusion. Dr. Amaresan will talk about it, but I feel and this is what the core committee also decided that lower the better, but the patient should be able to tolerate that. I think we can discuss this when we are going to have the encyclopedia. Question from Audience: Till date we used to say that the newer beta blockers are quite effective in controlling the intraaortic pressure in turn to avoid the ischemic heart diseases as well as the newer beta blockers are one of the best drugs as far as the endothelial dysfunction is concerned and now suddenly these molecules have been replaced by the ACE inhibitors and ARBs. Dr. Siddharth Shah: I talked about the use of beta blockers in a subset of population, it is not being replaced. According to guidelines, ACE inhibitors and ARBs are going to remain and in future you will find that as our thinking changes ACE inhibitors and ARBs are going to be the first line of therapy or I should just second line after the lifestyle modification. Dr K D Tibrewal: I just push you a last question. We have talked about lot of beta blockers criticism and particular atenolol. If a patient comes to you with a history of 15 years of atenolol he is taking and the BP is dot under control, the pulse rate has been under control, no side effects, pure hypertension, no other comorbidities, will you stop atenolol or you will continue with that? Dr. Siddharth Shah: Well, as far as the latest data that is available as far as the beta blockers are concerned there have been reports of adverse effects of atenolol. So, if I were given a choice, even if he is well controlled, we would go on to better molecule. This is my personal opinion, people may defer and mind you the use of atenolol in our country is so huge it is going to be difficult to change, but the core committee decided, we do caution the people for the use of atenolol. We do not recommend that you change over, it is up to your judgment, but that is what is recommended and core committee felt that this should be an initiative. Two initiatives have been taken by the Indian Guidelines on Hypertension. One is about the atenolol and the second is about the mercury manometer and these are the two initiative, which will definitely attract criticism, but we as a core group thought that this should be our focus for the future.